Businesses are hiring at a solid pace, as shown by Friday’s employment report. But the mix of jobs is also important. For those who have less than a college degree, the best career path may lead to a construction site. No doubt about it, the bulk of U.S. jobs are created in the service sector. Of the 223,000 slots added in June, 222,000 were in the private service sector. But the goods side of the economy on average creates better-paying jobs. And typically (although this is changing) these jobs do not require a college degree, which means the positions are accessible to a majority of workers. In the early years of this expansion, manufacturers were the ones hiring, while construction added positions in dribs and drabs. That split changed in 2013 and construction’s dominance is growing. According to the June jobs report, construction added about 260,000 workers over the last year while factories added only 160,000. In percentage terms, the gap is even larger. 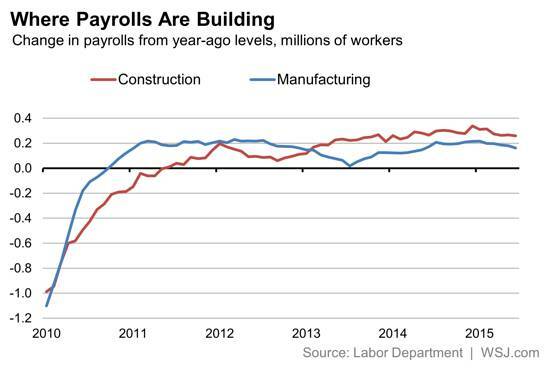 Building trade jobs are up 4.2%, factory slots 1.3%. Total nonfarm payrolls have increased 2.1%. Construction employment should outpace that of manufacturing for a simple reason: Construction, especially home building, is set to grow faster in coming quarters than manufacturing. The biggest obstacle that could hold back construction jobs is the shortage of certain skilled workers. No surprise, after housing went bust almost a decade ago, many construction workers found employment in other industries and may not feel like returning to the building site.